These pages describe ByRoute 4 between Callan (Co. Kilkenny) and Glengarriff (Co. Cork) on ByRoute 1. Mullinahone (Muileann na hUamhan) is the name of a small village (pop. 380) and large parish (pop. 1700) between the Slieveardagh Hills and the storied hill of Slievenamon / Sliabh na mBan. The land of the parish is for the most part on a limestone karst base, fissured with many caves and underground streams, subjecting some areas to flooding in times of heavy rainfall. In ancient Gaelic, this whole area, then heavily wooded, was called An Cuimseanach, suggesting an enclosed valley, and came to be known in medieval times as Compsey. The Pass of Compsey, one of the two routes from Ossory in Leinster to Cashel in Munster, crossed the river (a tributary of the River Anner) at the ford of Aghmonenahone at Mullinahone, under the old Norman keep in modern Carrick St., then continued via Cappaghnagrane to Fethard and Cashel. The Norman St Aubyn / Tobin family, feudal Lords of Compsey, were enjoined by Royal Decree to cut down the local forest to “ensure safe passage for travellers“. According to local folk memory, an army led by Edward Bruce, Earl of Carrick (in Scotland) and his brother, the Scottish King Robert the Bruce, spent a week in 1317 travelling the short distance from Callan to Cashel, looting and pillaging on all sides. Cromwellian troops visited in 1654 to dispossess the Tobins of their estates; most of the family was transplanted to Connacht. In 1691 a detachment of King William III‘s army camped nearby was detailed to ‘burn the Compsey’ as it was believed to harbour rapperees; however, the order was never carried out. The Great Famine and its immediate aftermath reduced the population of the area by as much as 27% over a decade of starvation and emigration. Mullinahone also suffered considerably during the late C19th Land War. The parish and people were very much involved in the War of Independence; a monument in the village square commemorates locals who lost their lives. Mullinahone was the birthplace of Charles J Kickham (1828-1882), a popular writer of sentimental fantasies and a leading supporter of the IRB / Fenian terrorist movement, regarded in some circles as a patriotic hero, whose remains are buried in the parish cemetery. His dubious achievements are celebrated each year at the Kickham Country Weekend. Mullinahone is nowadays best known for its sports heroes, mostly hurlers from the local GAA club, nicknamed the Kickhams. 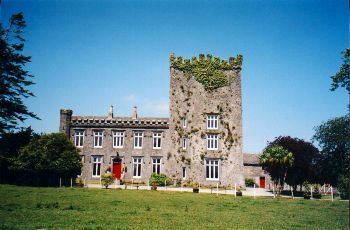 Killaghy Castle, founded in 1206, was the seat of the St Aubin / Tobin barons of Compsey. Originally constructed as a motte and bailey, it was walled and fortified over the next century, and a Tower House was built c.1500, with a long house added shortly afterwards. The manor was granted by the Cromwellian administration to a Colonel Green, whose granddaughter married William Despard in 1708. Their descendants remained in residence for over 150 years. The C18th saw the construction of two further buildings forming the structure of Killaghy Castle as it stands today, including the estate walls adjoining the modern village. The castle has undergone extensive restoration, and is now available for rent as self-catering accommodation at 2500 – 3900 Euro Per Week, depending on the number of people, with a recommended maximum of 16. A series of plaques guide visitor through the village and surrounding areas, from the old courthouse to a famine soup kitchen and the ruins of an ancient monastery. The history of the area has been well documented in a recent book by Michael Larkin. Mullinahone is south of Ballingarry on ByRoute 5. Crocanoir / Croc an Oir, a working farm with suckler cows, calves, horses, hens, dogs and cats, belonged for over 200 years by the Hawe family, who left in 1921. Its splendid Music Room is now run by John and Monika Birmingham as a venue for concerts and live music recording sessions. Self-catering accommodation is available in an attractive converted C19th barn and in the old farmhouse with its lovely stone courtyard. The rural location is ideal for tranquil riverbank and woodland walks. The church of the Immaculate Conception (RC) was built in 1853. A fine monument, erected in 1913, comprises a carved limestone pedestal bearing a lifesize statue of Michael Cusack (1847 – 1906), founder of the GAA. Drangan also has an attractive old village pump. Drangan was the scene of fierce fighting on 23rd June 1920, during the War of Independence, when the IRA launched an attack on the local RIC barracks, and the defenders held out for over seven hours. The grounds of St Mary’s parish church (CoI), now in ruins, contain both Protestant and Roman Catholic graves. Bridget Cleary (née Boland) (1867 – 1895), a dressmaker known for her independent spirit, still childless after several years of marriage to a cooper, took to visiting the fairy forts in the district, ancient Rigforts widely regarded as haunted by “the fey folk“. When she fell ill on March 6th, 1895, a doctor diagnosed bronchitis, but her husband became convinced the fairies had stolen her soul, leaving behind a changeling who was not his wife. For nine days he and several of Bridget’s cousins, uncles, in-laws and neighbours, in an effort to force the release of the real Bridget, doused her with urine and hen’s dung, forced fed her herbs and potions, and brandished fire brands. In the predawn hours of March 16th, they dressed Bridget in her best clothes and laid her before the hearth, where her husband doused her with lamp oil and burned her to death. Her corpse was then buried in a bog dike little more than 1000 yards from their cottage, where the local preist discovered her five days later. A coroner’s inquest was held, and nine family members were charged with murder. The trial became a political bludgeon with which anti-Home Rule parties tried to embarass prominent churchmen or denigrate the whole population as primitive savages. The relatives found guilty were imprisoned for periods ranging from six months to five years, while Bridget’s husband Michael was convicted of manslaughter and served fifteen years of his twenty year sentence at hard labour, before eventually emigrating to Canada. The Roman Catholic Church was unwilling to be associated with a scandal so steeped in ignorant superstition, so two constables quietly buried Bridget’s body just outside the old churchyard wall, near her mother’s grave. Her story has since been sporadically sensationalalised as the Case of the Fairy Witch of Clonmel. 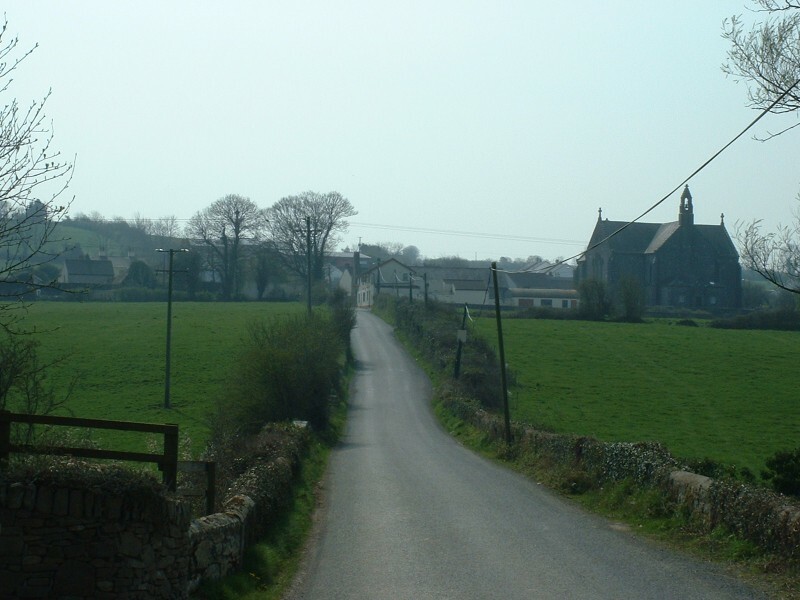 Cloneen is a rural community, nowadays best known for its GAA activities. The church of the Nativity (RC) dates from 1815. Cloneen is west of Killamery on ByRoute 3. 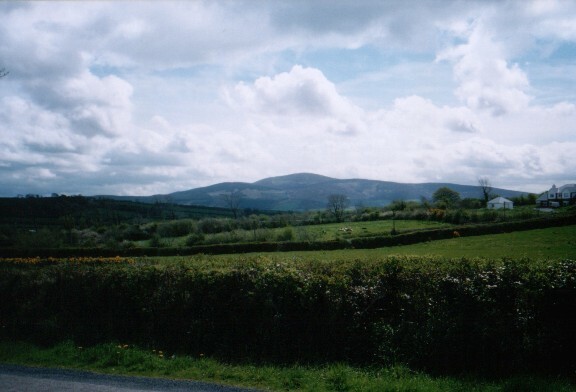 Carrigmaclea / Carraigmoclear, a low hill attached to Slievenamon, was the site of a skirmish during the 1798 Rebellion, when a group of insurgents were surprised and killed by Crown forces. A wooden footbridge straddles the River Anner at the foot the hill, providing access to steps all the way to the top. The Slievenamon Bog is a Natural Heritage Area, presenting “a mosaic of vegetation types, including mountain blanket bog, headwater bogs, wet saddle bogs, dry heath, wet heath, flushes, acid grassland and vegetated, river gorges“, and notable for its wide variety of birds and butterflies. The slopes, largely covered with Coillte forestry, are criss-crossed by numerous paths and tracks, popular with mountain bike and scrambler enthusiasts. A cairn at the top of the hill, thought to be a prehistoric passage grave, and reputed to be an entrance to the Celtic Underworld, has yet to be excavated. Sliabh na mBán is said to have got its name from the legendary Feimhin (fairy women, perhaps the same as those later identified as Horned Witches), who enchanted Fionn mac Cumhaill and his followers. Another tale tells how Fionn decided to sit at the top and choose his bride from a group of women racing to meet him. The first to reach the summit (allegedly with some help from Fionn, who fancied her!) was Gráinne, who went on to become notorious for her adventures with the hero Diarmuid. The hill inspired County Tipperary’s unofficial anthem, Slievenamon, a romantic song penned in the mid C19th by the local Fenian poet Charles Kickham and regularly sung by crowds at sporting events. Ireland's Holidays, Special Days etc.